Let’s be clear: Peter Yates’ Krull isn’t a particularly good movie, but it is an awesome one and easily deserving of a remake to correct the problems–which I will go to in a moment–that are there. How can one movie be two seemingly contradictory things? Mediocre and awesome at the same time? Quite easily. Visually, Krull is a fascinating movie though the Sanford Sherman-penned screen story could have benefited from a few more rewrites to tighten things up. The movie revolves around a kingdom on an alien world. The citizens of this land look human, and technology-wise are at a medieval level of development, as is the structure of their society–they also happened to be primarily British, except for Ken Marshall, which tells you a lot about the origins of the production. Though appearances can be deceiving, because while the citizens of Krull (the name of the planet as well) may look human, they had capabilities beyond those of normal people. One that’s particularly worth mentioning is that they had a remarkable tolerance to heat (one character inserted his hand into bubbling–which in movies typically implies heat–lava. According to Wikipedia lava can vary in temperature, though is often between 800 to 1100° C, or 2012 to 1472° F, which is really, really hot. So on a beautiful, sunny day, two warring kingdoms are holding a meeting with a goal of halting all hostilities between their two kingdoms as well as to celebrate the marriage of their children, Prince Corwyn (Ken Marshall), the son of King Turold (Tony Church) and Princess Lysse (Lysette Anthony), the daughter of King Elrig (Bernard Archard). Though the supposedly secret meeting is attacked by strange, alien-looking invaders known as Slayers. Their attack is as relentless as it is efficient, and virtually everyone in attendance is killed, except for Lysse–who’s kidnapped by the Slayers–and Colwyn, who’s shot, though not fatally. With the bodies of both friends and foes at his feet, Colwyn sees no other option but to seek out a mythical weapon to free his love and his kingdom. The master of the Slayers is known as the Beast, who moves from planet to planet in their star-spanning fortress, devastating worlds and killing with seeming abandon. Hola, I’m the Beast. Glad to meet you. As you can see from the picture above, the Beast (despite having a massive head) is humanoid, which is interesting because its servants, the Slayers, aren’t. They appear so initially, but whenever one is dealt intense bodily harm, a large, octopus-like creature bursts from their heads, and burrows into the earth, seemingly never to be heard from again. The Slayers also seem to exist in a hierarchy of sorts, with the regular slayers being various shades of gray, and the elite–those that defended the fortress and the Beast–being white. They also appear capable of mimicking the form of humans, though this appears to be an ability of the parasite within the Slayer’s head, as opposed to the entire creature. An interesting idea is that, since that creature ejects itself their heads, it exists either symbiotically or parasitically with the body of the Slayers–in other words one Slayer is composed of two individuals. It’s a great idea, which a remake would hopefully explore. A dying Slayer. You can see the slug leave it’s head around 0.38. They also look as if their design was inspired by Ridley Scott’s Alien (which makes sense, considering that that film came out in 1979, and the work of H.R. Geiger has been remarkably influential in movies since). The Beast and its legions of Slayers are supposedly more advanced than the worlds they invade, though there’s no indication that that actually is the case (other than the Beast’s Moving Castle). For instance, the main weapons of the Slayers were battle staves, that launched a single projectile, which military technology-speaking, isn’t all that advanced. Once the projective was launched, they rotated their staves, using the other, bladed end as a melee weapon. In fact, the Slayers don’t appear to be any more effective–or advanced (other than their one-shot projectile weapons)–than a typical medieval army during later periods of the Middle Ages. It would stand to reason that the Beast is somehow mightier than his servants though having seen the movie, you’d be wrong. 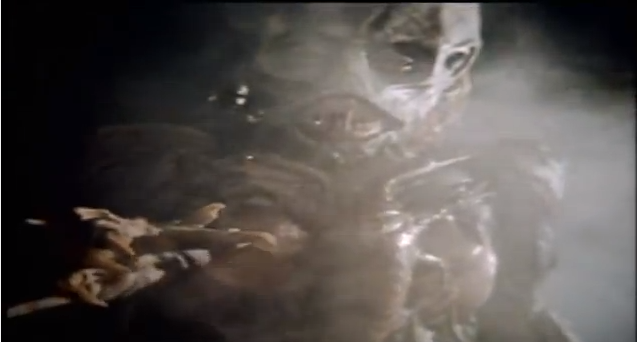 Colwyn at the end of the movie faces the creature, who blows fireballs at him. Yep. Apparently the mighty, world-conquering leader of the Slayers most threatening ability is the power to blow bubbles of energy at his opponents. A remarkably lame ability that’s almost made up for by the weapon that Corwyn had found, the glaive. 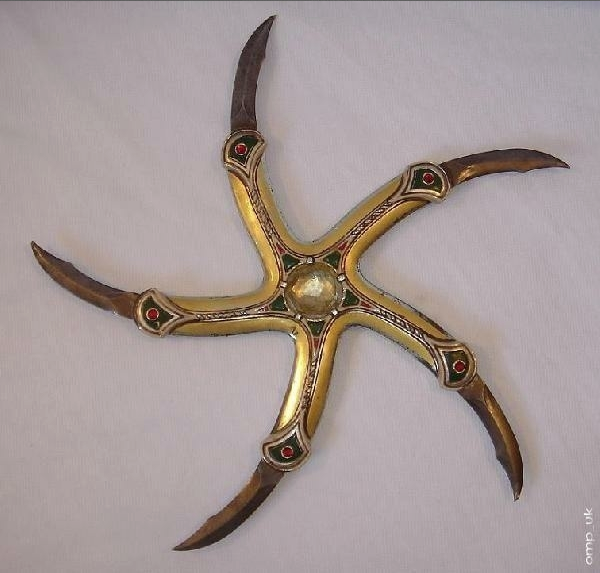 A glaive is typically a blade upon a pike, though in Krull it vaguely resembles a huge five-armed Japanese throwing star, its surface covered with precious metals and gems (as well as sharp blades, that retract when not in use, on each arm). It also seems somehow psychically linked to the person that discovers it, because when thrown, it (if possible) comes back to whomever threw it, despite having no apparent power source. The glaive was the only weapon capable of defeating the Beast–which is really interesting because, technically speaking, it didn’t. It goes without saying that before he found the weapon he encountered many dangers, though along the way he made some friends that included a bunch of brigands, a cyclops, and a bad magician. And speaking of the brigands, two of them, Ruhn and Keegan were particularly noteworthy because the former was played by a young Liam Neeson, and the latter by Robbie Coltrane. Another thing is that magic appears to exist on the world of Krull, which kind of clashes (pardon the pun) with the Beast and his Slayers, which are more science fiction-based. As I said earlier, the awesome in Krull often managed to overpower the silly, but not by much. Luckily, to make the movie more awesome only minimal changes are required. Such as the amount of screen time given to origins of the Beast and Slayers, which needs to be increased significantly. Where are they from? Why do they move from world to world, conquering and destroying as they go? Some explanation would go a long way toward fleshing them out as characters, as opposed to just evil monsters, which is always a good thing. The Beast was also pretty weak and needs the same treatment. It’s apparently a giant, yet the Slayers aren’t. Why? And what’s with him shooting (lame) fireballs from his mouth? How about raising the stakes? Give Corwyn a really powerful enemy (in more that name) would do the trick. Krull is also remarkably uneven tonally. At times it appears to be almost aimed at younger viewers, while at others it come very adult. If the movie is going to be violent, then it needs to be violent. If it’s not, then OK, but it can’t serve two masters. Posted in actors, directors, genre, Movies, sci-fi, The Unnecessary Remake Dept., writer.Tagged Alien, Bernard Archard, glaive, H.R. Giger, Ken Marshall, Liam Neeson, Lysette Anthony, Middle Ages, Peter Yates, Ridley Scott, Robbie Coltrane, Sanford Sherman, Tony Church. The (Un)necessary review, rife with grammatical errors and lacking any insight. Like ‘rife,’ you don’t seem to know what insight means either. Learn to take critism and not just dish it out. If Krull is re made, most likely it would be ‘rife’ with political and social commentary and criticisms which will go a long way towards making any re make no different than almost every movie made today. Just the next soapbox for preaching political and social correctness, devoid of ANY type of ethical or moral spirituality, with the required ethnic diversity, undoubtedly featuring some climate change and l.g.b.t+ just for bad measure. I don’t necessarily disagree with your point, but wonder why you cast such changes–any good art in some way reflects the where and when of its creation–as negatives. In other words, all art is in some way a political act. As far as political correctness goes, what that term tends to mean is that you have groups that refuse to allow themselves to be trampled, and are vocal enough to let people know about it (and which the majority have to grudgingly respect). That may bother you, though perhaps you should ask yourself why respecting other people and their beliefs is something you find so onerous. Yes, the movie had great imagination, but the story, characters, and acting weren’t as strong as they could have been. Usually I hate remakes, but there was so much left on the table, and the possibility of correcting some of the flaws of the original is intriguing. It was a bit weak, acting-wise (never mind wildly inconsistent) but it was ambitious, which can make up for a lot of sins.